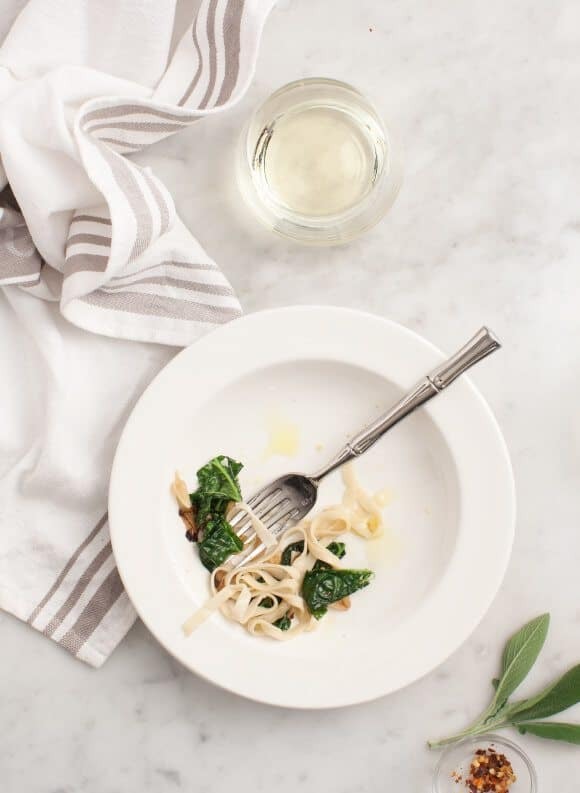 Just 10 ingredients - including balsamic, sage, and caramelized onions - make this simple pasta so delicious that I always go back for seconds. Before I get to today’s recipe, I have some exciting news for you – do you remember this trip to Sonoma that I went on a few months ago? Well now it’s your chance to go on that exact same trip, hosted by the lovely folks at Fortessa. You’ll get to stay at the gorgeous Fairmont hotel, attend cooking class at the original Williams Sonoma Store, and of course have amazing food and wine the whole time. It was tons of fun (click here to enter) my fingers are crossed for you! Now back to the recipe! This pasta is super easy, yet warming and wintery. Lightly caramelized onions and fennel are tangled within fresh linguine noodles. Sage and a splash of balsamic make it earthy yet still a little bit bright. I was going to sauté some lacinato kale until I spotted this gorgeous tatsoi at my farmers market – how pretty is that? Of course, if you can’t find tatsoi near you, kale or chard will work perfectly here as well. When Jack and I first got married, we got (what I thought was) a really nice set, but over the years, it’s chipped, scratched and now oddly numbered because we’ve broken so many pieces… and I won’t even get started about how many wine glasses we’ve gone through. But not anymore! The Fortessa ceramics and Schott Zwiesel glassware is chip-proof, break resistant. It’s used in many many 4 and 5 start hotels because it’s so lovely and also insanely durable. Which means that we feel like very fancy adults now. Pictured: Fortessa Rim Soup Plates, Royal Pacific Flatware and Schott Zwiesel Pure Double Old Fashioned Glasses. 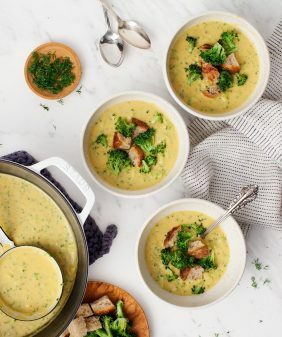 Fortessa dinnerware, flatware, and Schott Zwiesel glassware are all available at Williams Sonoma stores and online. 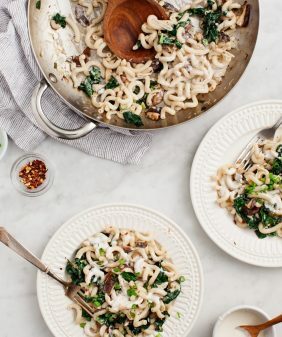 This delicious pasta would make a great winter weeknight dinner. Skip the cheese to make it vegan, and use whatever winter greens you can find. Heat the oil in a medium skillet over medium heat. Add the onion, fennel, garlic, and a few pinches of salt and pepper. Cook, stirring occasionally, until the onions and fennel are golden brown around the edges, 8 to 10 minutes. Stir in the balsamic and cook 2 more minutes until the fennel is very soft and the onion is lightly caramelized. (If necessary, reduce the heat and add a little more oil to prevent the onions from burning). Add the sage and stir. Bring a large pot of salted water to a boil. Prepare the pasta according to the instructions on the package, cooking until al dente. Do not drain. 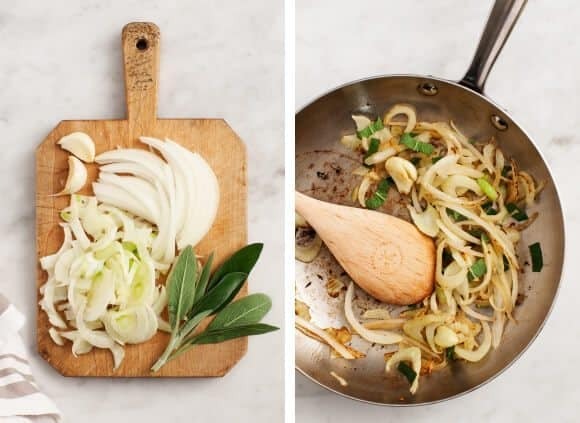 Remove the crushed garlic cloves from the onion mixture, then scoop the pasta into the skillet directly from the water. Add the tatsoi leaves and toss until everything is incorporated and the tatsoi is wilted. 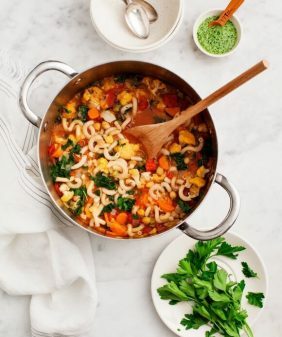 Add ¼ cup of the starchy pasta water, if necessary, to help loosen the pasta. Season to taste with more salt, pepper, balsamic, and a squeeze of lemon, if desired. 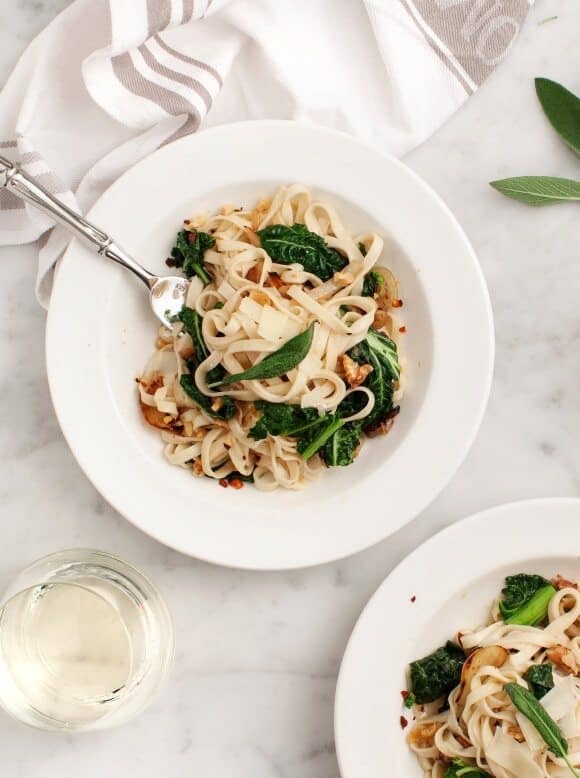 Serve in bowls with toasted walnuts and Parmesan shavings, if using. 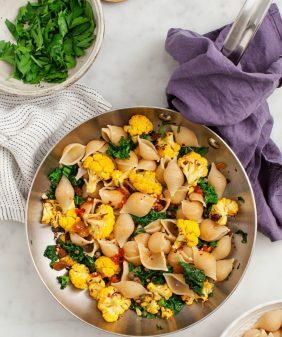 Make this vegan by using vegan pasta and omitting the parmesan cheese. Make it gluten free by using gluten-free pasta. This post was created in partnership, and is a sponsored conversation written by me on behalf of Fortessa. A yummy pasta AND a chance to go on a trip?! Woo hoo!! This recipe sounds great. I need to cook more with fennel! This looks like a meal from heaven, so cleanly yummy! Not to mention there’s so many positive benefits of eating fennel. This looks like it might have to be on the dinner menu tonight. Love fennel! This looks gorgeous. I’m still getting to know fennel, and I’ve yet to be introduced to tatsoi, so I’ll have to make this very soon. Yum! This sounds delicious! And those glasses sounds like exactly what I need. 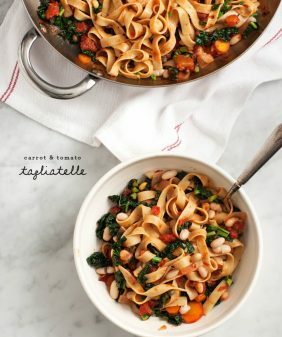 This is such a gorgeous bowl of pasta! I’m obsessed with fennel this year. So this is going right up on the “to-make” list! I always look up to every recipe you post daily and this will be listed down to my “to-cook-list” this weekend. Looks easy to prepare. My family will surely love this! Wow this looks gorgeous and easy, just what i’m usually looking for! I think I’ll try this tonight. Thanks for the inspiration! Yum! Really simple to make. Clean and fresh. We loved it. This was sooooooooooo good. I would never think to pair walnuts with this dish but YUMMMMMMMMMMM was it good! I have yet to try a recipe from your website I dont like! GOD BLESS YA AND YOUR SKILLS! 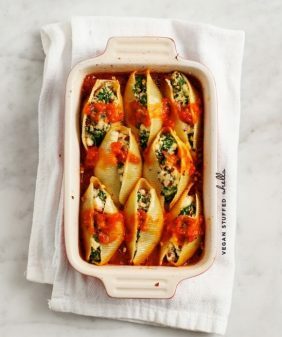 Love this dish! I’ve never tried many of the flavors together: fennel, tatsoi, and walnuts together but it’s delicious! Our CSA found your recipe and sent it to us for our recent box that included fennel, tatsoi, leeks, and kale. I used both greens and the leeks instead of onions plus the fennel per instructions. So creative, thank you!